Date Pickers can be used to select date or a range of date as input to a process. dateFormat: 'dateFormat': "'On' d 'Day of ' MM ', Year : ' yy"
Once the user select a date or change the selection it will fire the change() function. On Selection of the date from the calendar we will display the selected value to the user through a div tag. While displaying calendar to the user, which day of the week will be shown at left side or in the first column. It can be any day of the week from Sunday to Saturday. This Options take integer from 0 to 6. Using this we can change our calendar columns staring from left to right. We can show our calendar with Saturday and then Sunday at left column by making firstDay as 6. These options we can use to set the maximum and minimum selectable dates from the calendar. Today is the maximum date user can select. Let us try with maximum selected date one week from today and minimum selected date one week before today. For Maximum selection of dates we can have different options. 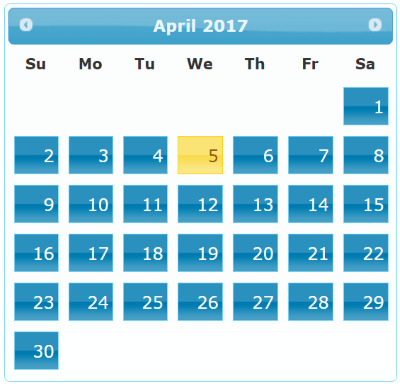 For Minimum selection of dates we can have different options. By using JQuery we can use defaultDate option to set a default for the calendar. Similarly we can use setDate to fix the date of any calendar. We can display a dropdown for users to select the year, same time we can set the range of the year to be shown inside the dropdown. Two date pickers showing Start date and end date of any event. If Start date is selected then end date has to start from or beyond start date only. If end date is selected then start date has to be before that. Date Picker with range of dates. Same way if end date is selected first then start date can't be before 15 days. We have two calendars. Once the End date is selected in second calendar then that will be the maxDate of first calendar. Similarly once the start date is selected from first calendar then that will be the minDate for second calendar showing end date. Here maxDate and minDate are selected dynamically which changes based on selection of dates by user. For second date picker the minimum date is variable which is taken from the selection of first date picker. One event is of maximum two week duration, create two calendars where end date and start date can be selected. : A tooltip message to display  for the date cell. We will use all these three on different examples . We will change the code inside the function as per our requirement to return the above array. To call this function we will use jquery code like this. Let us start with making some days selectable by user or not. Show a calendar for which some dates will be disabled. Here is a calendar to show current month or any other month with 14th 19th and 25th of the month are disabled. Disable calendar dates for selection by user. Now we will keep some fixed dates for which the calendar cells will be disabled for selection. This has more practical uses as you can connect this to a database where you can read the dates to populate the array not_available_dates so they can be made available or not based on the script requirement. We are not discussing here how to enter database records or displaying them , you can read them in our PHP section. User can select two dates from two calendars and the script will find out the difference in number of days between them. Here is a modification of Calendar to given only option to select Month and Year. No date part is shown to the user. We need to show a calendar with different color of cells based on some condition. Tickets or availability can be sown in green or red color backgrounds where red color shows non availability and user can't select the date. We can check our date picker by applying different themes. The theme CDN is displayed below the date picker, you can use that in your pages. How to use different themes are explained at JQuery Home. in jquery 2nd,4th saturday and all sunday's should be disable using datepicker in asp.net. Jquery date picket looks nice. Where is the source code? Full code that I can run on my page? This is explained at the top of the tutorial. Note that this date piker will work with all JQuery support.